I have still been loving the Bake Off. Yes, I love Mel and Sue and I miss them (and Mary) but Noel and Sandy are funny too. And really I watch it because I find it so relaxing- I don’t mind who goes home or who wins. I like to see them bake new things and decide that I will never attempt something that looks such a faff (mini swiss rolls) or maybe give something a go (I think the first time I tried to make a Battenberg was because I had seen it on Bake Off). 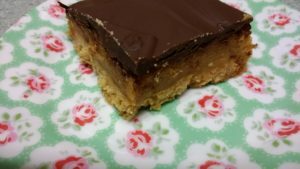 Anyway, the other week was caramel week and inspired by it (because I think they made it look harder than it actually is) I have created my own recipe for peanut butter caramel slices. Cream together the margarine and sugar for the base. Stir in the flour and oats, then press into the bottom of the tin. 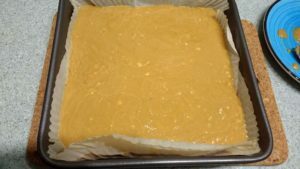 To make the caramel, put the butter, sugar, condensed milk and syrup in a pan. Gently heat and stir for around 10 minutes. 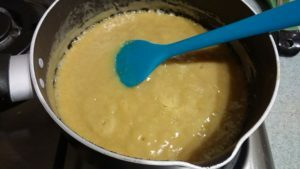 The mixture will bubble but it should not spit. It will gradually turn darker as it thickens. I don’t use a thermometer for this bit- to test if it is thick enough put a little blob on a plate, leave for a few seconds and then push it with your finger to see if it has thickened. Once it has thickened, turn off the heat and stir in the peanut butter. Pour the peanut butter caramel over the base and leave to cool. To make the topping, melt the dark chocolate (I have a nice thick bowl that I can use in the microwave) and then stir in the peanut butter. Pour over the caramel and leave to set again. Once set, slice and enjoy. 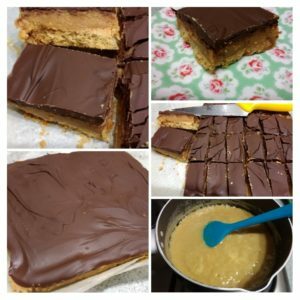 Do you like caramel slices? What would your ultimate flavour combination be? Oh my! I might have to give these a go. My colleague brought some in that her husband had made and I very nearly went home with her as they were so delicious! Previous Previous post: The home of parkrun!!!! Next Next post: Bright10 2017, bad things coming in threes and a power cut!